One of the most impressive features of the Motorola Moto X when it debuted in 2013 was its touchless control. You could execute voice searches and commands with your Moto X without touching the device. Just say, "OK Google," and the phone was at your command. "Ok Google" is a hotword that tells Google that you’re ready to start using your voice to search. Over the years the introduction of different mobile devices and their apps has shaped the keyword search query landscape, from Flip Phones to Smartphones and now to Siri-like search voice commands. The length of search queries in mobile search has grown dramatically. In 2004, the majority of searches were 2 to 3 words in length. In 2009, longer search queries showed up on Search Query Reports (SQR) but the bulk of the search queries were still 1 to 4 words in length. 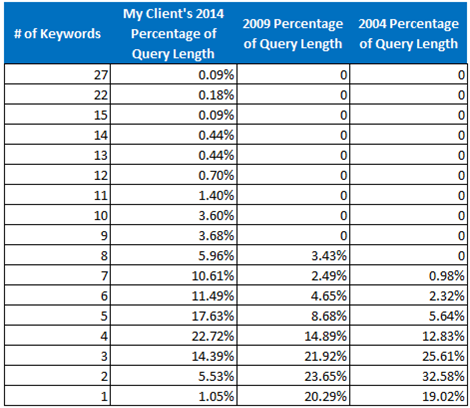 Now In 2015, anyone that looks at their SQR will see search queries as long as 27 words (no way anyone typed that in). How are we going to capture those 27 word search queries? Modified Broad match. With modified broad you can guarantee that specific keywords are included in the search term captured (ie. +pizza +san +francisco). Regardless of how intricate the search query becomes you can still show your PPC ads for these longer search queries. Voice search will soon be the primary way that users interact with smart devices, especially as the operating system expands into cars (Google Auto) and onto wrists (Apple Watch). Instead of typing your query into a search bar you will have a conversation with Siri. Want to get around the mandatory enhanced campaigns for Google & Bing? Would you rather show your ads on mobile only? Unfortunately the tablet modifier can only be increased by 20% in Bing so you can't make tablet only campaigns. You can however make mobile only (or almost mobile only) campaigns by lowering CPCs by 66% and raising the mobile modifier by 300%. This works best if your new CPC is lower than the first page bid for desktop. This 300% mobile modifer works on Google too but one account we work with saw a possible penalty. Mobile performed much better than Desktop in this account but we didn't see that reflected in the CPA of the campaigns with the mobile modifier set at 300%. I can't confirm that a penalty was placed on that account for trying to skirt the system but those are the facts. Bing is following the leader on close variants. No longer will true exact match exist in Bing Ads. On May 21st, Bing Ads will be making two changes to the way keywords are handled. Close variations include misspellings, singular and plural forms, acronyms, stemmings (such as floor and flooring), abbreviations, and accents. The problem is sometimes the plural keyword performs differently than the singular keywords. Or a stemming means something different (ie. printer & printing). This is a tricky one. No longer will single negative keywords stop phrase keywords from showing. For example, usually you could add "free" to stop "free shoes." Starting May 21st this will not work anymore. Now you must use the [free shoes] negative match. Plus, if you have [free shoes] positive and [free shoes] negative, Bing will prioritize the positive over the negative. The good news is Bing gets more money from advertising but it creates a headache for advertisers. Yahoo! and Bing have created a new agreement as of this morning. Yahoo! 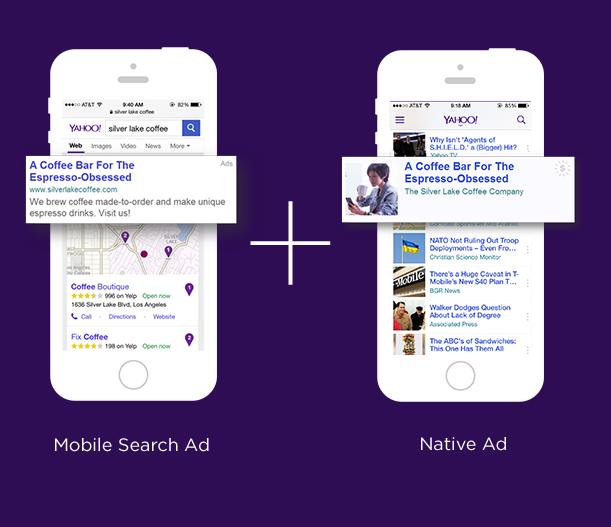 now has full control over mobile ads using the Yahoo! Gemini platform. Mobile under the new deal includes Smartphones & Tablets. But Now Yahoo! can run 49% of their own desktop ads (most likely with the Yahoo! Gemini platform). Yahoo! can also have Google serve a portion or all of the 49% of desktop ads. You will need to sign up for a Yahoo! Gemini account if you want to show 100% of the time on Yahoo! For now Bing remains the provider of ads for Yahoo! Desktop search but that is going to change soon. What about Premium Buyers (Major Advertisers)? Yahoo! used to service both Yahoo & Bing ads. Now Yahoo! services Yahoo! ads and Bing services Bing display ads. Instead of one Yahoo! rep for all Yahoo! & Bing ads, you will now have two points of contact for advertising on Yahoo! & Bing. 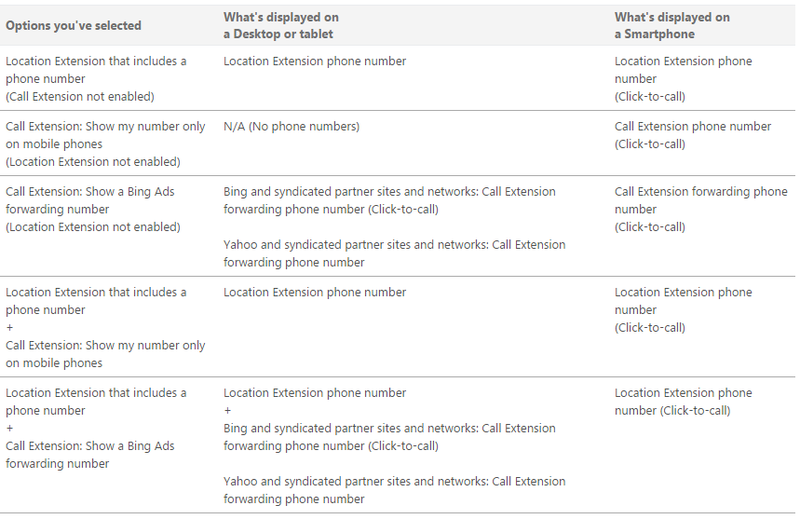 If you have phone numbers in your Bing ads you will find them disapproved in June 2015. Instead of phone numbers in ads you can use Call Extensions for Bing. Call extensions are useful because they can show both your website and phone or just a phone number only. If you have a local business with no website, this is the best way to do call only Bing Ads. What happens when I use both Call and Location Extensions? According to Google, 70% of mobile searchers call a business directly from search results. Call-only campaigns are specially designed to only show on mobile devices that can make phone calls. Every click you pay for can be a phone call to your business. How can I create a call only campaign? On the "Campaigns" tab, click the +Campaign drop-down menu, and select Search Network only. Add a name for your campaign. To help you find your campaign later, you might want to indicate in the name that this is a call-only. Choose the campaign type Call-only - Ads that encourage people to call your business. Choose your Networks, Devices and Location targeting. Under Devices, note that your ads will only appear on devices that can make calls. Under “Bid Strategy,” keep in mind that all clicks on your ads will result in calls to your business. Select any other settings you'd like for your campaign. Phone numbers that haven’t been approved will be listed as “Unverified” in the Ad extensions tab of your Google account. To get phone numbers verified, you’ll need to take one of these steps. Have the phone number being used in the extension listed on the website (in text). Link your AdWords and Google Webmaster Tools accounts. Add your AdWords conversion code snippet to the landing page in your ad. What if I use Marchex or IfByPhone for Call Tracking?You can still perform step 2 above. Yahoo Gemini - How Did I Start Showing ads on Yahoo Gemini? Yahoo Gemini is a PPC platform and the first unified ad marketplace for mobile search and native advertising. Great, but what you might not know is you may already be opted into Yahoo Gemini for PPC without even knowing it. If you are currently running ads on Bing Mobile, you are probably running ads on Yahoo Gemini. In March of 2014 Yahoo began auto opting in advertisers from Bing to Yahoo Ad Manager. Yahoo slowly migrated people over to Yahoo Gemini throughout 2014. The only way you would find out is if you looked at your Bing PPC invoice closely. What about optimizations on Yahoo Gemini? Yahoo starts your account in a read only state. Every change you make in Bing Ad Marketplace is duplicated over to Yahoo Gemini. You can opt into making changes directly in Yahoo by calling cQualified at 925-381-7921, you will need a dedicated yahoo email address to start. What Native Advertising Does Yahoo Offer? Yahoo Ad Manager also offers native advertising in-stream, usually in news content. Stream Ads appear front and center across major Yahoo sites by naturally blending into the content streams viewed by users. They’re served in the personalized content streams of major properties including Yahoo News, Yahoo Sports, Yahoo Movies, Yahoo Mail, and more. Have you heard the news? 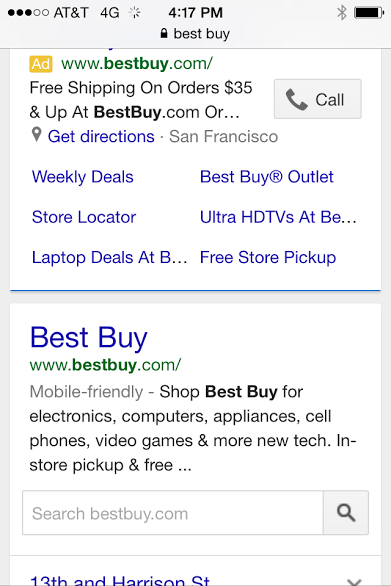 Google is making mobile-friendly an algorithm signal for mobile search results. "Starting April 21, we will be expanding our use of mobile-friendliness as a ranking signal. This change will affect mobile searches in all languages worldwide and will have a significant impact in our search results. Consequently, users will find it easier to get relevant, high quality search results that are optimized for their devices. Or you can test your website by going to Google on your mobile phone and search for your website, If it doesn't say "Mobile Friendly" then you probably won't show up for non branded search in Google. Will Brand get affected by the Mobile Algorithm Signal? Everyone is saying no. You should be good on your own brand name. Make sure you check it on April 22nd however.